WINTER RANGE What's a Conventioneer? Just asking but I am having a problem accessing the Winterrange.com website. My copy shows last update as of June of this year with no ability to see any of the "who's coming" cart policy or schedule stuff. Also this is to be my first Wild Bunch match as my work schedule has prevented this in past years. I was hoping to get a confirmation letter or email as my entry check cleared my bank on Nov 20 and I have to submit my vacation schedule by December 8 to be sure I have all my days off in order. I know the Wild Bunch fills up quick so I have called the contact number 1-623-465-8683 on five separate occasions and left messages but have not yet heard back. Do I have bad contact info or am I just not technically savvy to understand the website or ??? Hoping to hear from someone as this is my one and only "Can't Miss" match and I love being there. If I need to resend application or whatever needs done could you please advise. I submitted my vacation request so I have time off for Wild Bunch and Cowboy, a bit nervous that I do not know if all the paperwork is done. I don't check this that often, but I do know Kay is back and working like a mad woman. They have posted a "Who's Coming" list now on www.winterrange.com and your name is on the list. Technically we are fully, but are going to raise the limit a little, in many ways cause of the fine work most of our Marshals do. So tell your buddies to get their apps in now! Great shoot!!! Did I say great shoot? In case you were wondering, great shoot. Been there many years. Go, enjoy all the rounds you will put down range, and have some fun! Great hosts!!!! Thank you for making WR such a spectacle! Makes the Ranger's work feel appreciated. They are an awesome bunch that have chosen to give back to our shooting friends. Unfortunately, yes a lost brass match. WR is full again at over 750 shooters,approaching 1,000 total participants. We try to accommodate our folks who wish to shoot. Therefore, as we add to the total posse count, there just isn't enough time to shag brass. Winter Range Wednesday Side Match Day Volunteers Needed! What makes WR so great is all those folks that choose to give back a little more to their fellow shooters. How many more of you are one these special WR folks? 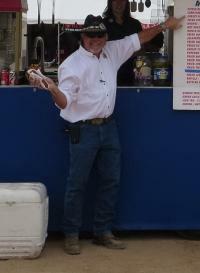 I wish to say thank you to y'all at SASS for your continued efforts on behalf of us, the membership, and helping us to continue playing Cowboy/Cowgirl is a safe, fun and very social atmosphere. Thank you again.